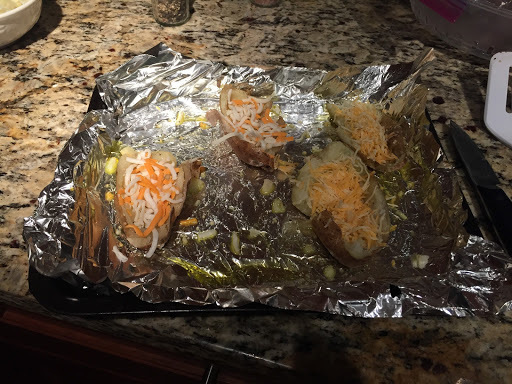 If there is one thing I love to eat, it is potato skins. 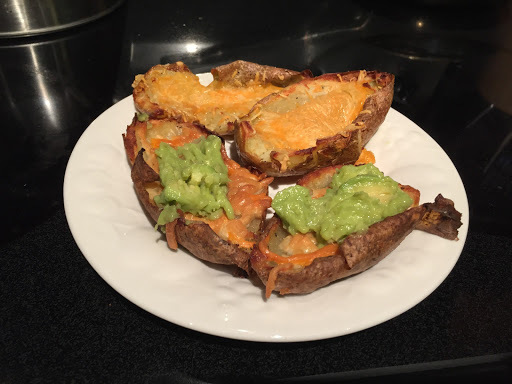 Unfortunately, most bars serve them with cheese and bacon (I am pescetarian and can’t eat dairy) and that kind of defeats the purpose of me eating a potato skin because it’s all about what’s in them! So I decided to try and make them myself and I have to say they are pretty yummy and much healthier than ordering them at a bar. These are especially yummy during football games on Saturday and Sunday. So I have put together my recipe for you of how to make them and fast! 2. 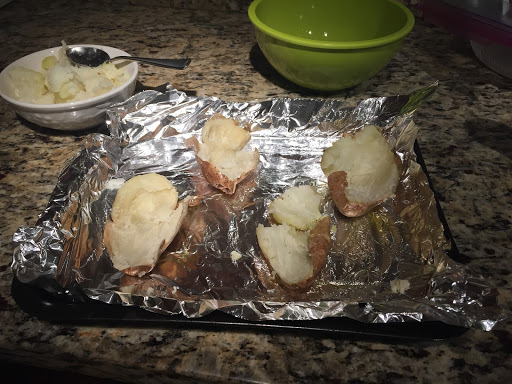 Wash your potatoes and then puncture them with a knife a few times. 3. 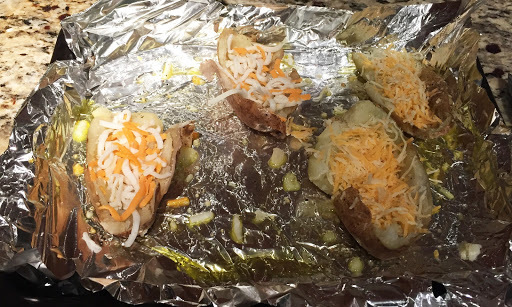 Wrap them a paper towel and microwave for 5 minutes. 4. Take them out, squeeze to see if they are soft. If they aren’t put back in for 2 minutes. 5. Fill a bowl with olive oil and salt. 6. 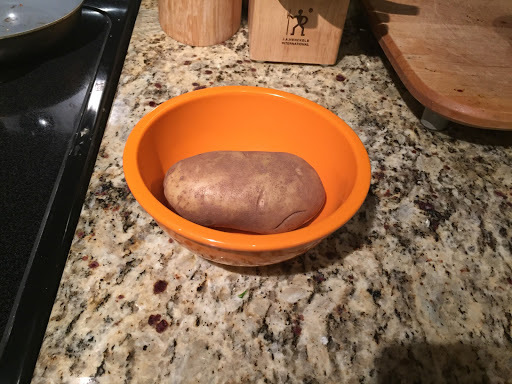 Once the potatoes are done, take them out of paper towels and place in the bowl. 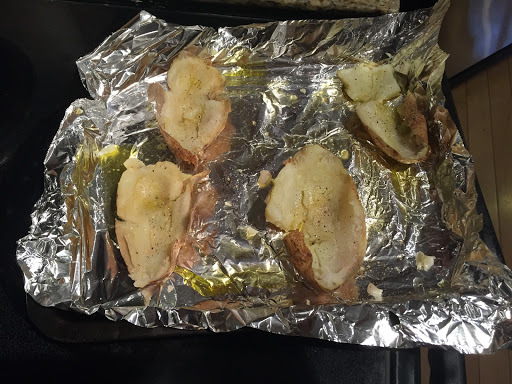 Roll the potatoes in the oil and make sure they are fully covered before placing on the baking tray. 7. Once on the tray, cut them in half and scoop on the inside. Make sure you leave a little on the bottom. 8. 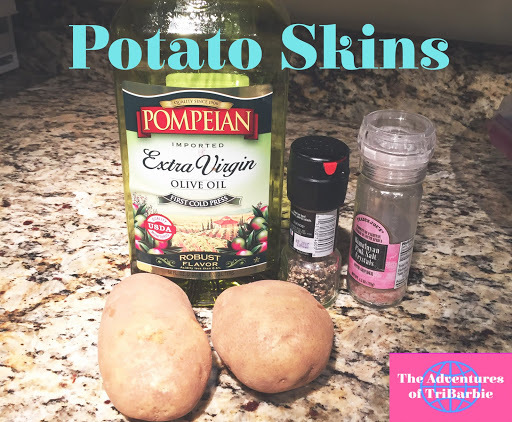 Once all are scooped out, drizzle the leftover olive oil from the bowl onto the potato skins. Then sprinkle with salt and pepper on the inside. 9. Take your choice of cheese and sprinkle on top. If you would like to add bacon, make sure it is already cooked before placing on top. 10. Place in oven for 10 minutes, take them out and put a dollop of guacamole or sour cream on top and enjoy!